The EchoSpan system gives you the ability to administer 360-degree feedback reviews in multiple languages with ease. You can apply your own translated content for review items, competencies, rating scales and relationship groups. Custom translations of screen interface elements, such as buttons and menu options are possible with the Enterprise edition of the tool and are handled automatically in the Professional Edition. 140 total languages are currently supported and you can apply up to 10 custom language translations per project. Language translations are selectable by the user when he or she responds to a survey. This way, your Raters are permitted to read and respond to reviews in the language that is most familiar to them. NOTE: The language translation feature does not translate any Raters' responses to open-ended items, those are displayed as-entered within the final review reports. For ease of administration, your review content, rating scale, and relationship groups are accessible on one page in the admin tool for each individual project. On this page you are able to select the element category you would like to translate from a drop-down box. 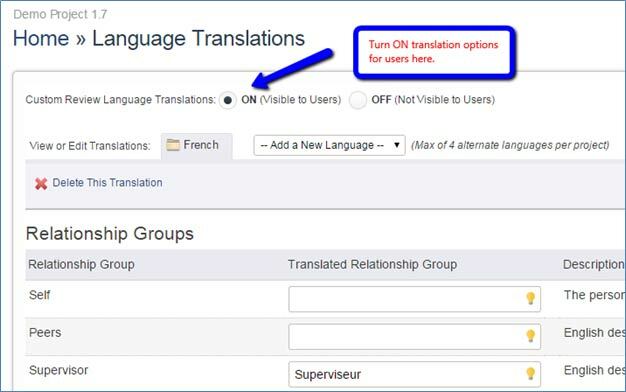 This feature can be accessed from within any 360-Degree Feedback project by going to the Setup menu option and clicking "Language Translations." Set up your project as normal in your default language (typically English). Add your competencies, items, rating scale, relationship groups, etc. Next, apply translations from the drop-down menu, select Setup >> Language Translations. Use the "Add a New Language" drop-down to select the language you would like to add. Now enter translations in the fields provided for Relationship Groups, Rating Scale, Categories/Competencies, and Items/Questions. Select which elements you would like to translate by using the drop down box titled "Translate." Your entries will be saved as soon as they are entered and can be edited if needed. 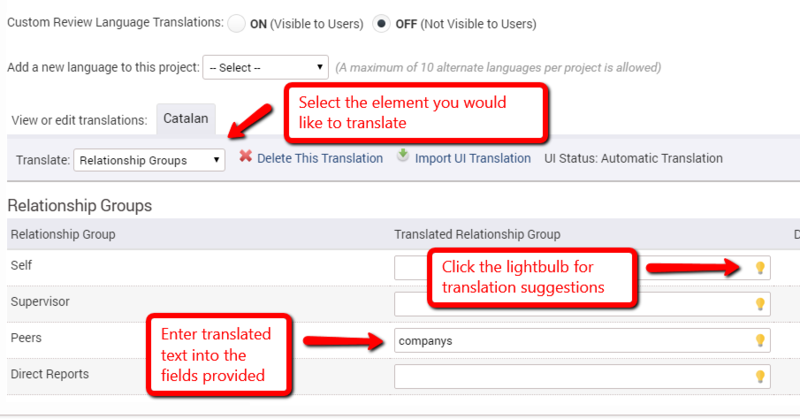 You can also view automated translation suggestions that are available for each element by clicking the light bulb icon inside of each translation element field. Once your edits are complete you can make them available to your users by selecting the "ON" radio button at the top of the page. If a user selects a language to translate their review, they will see your custom translations for all customizable text (review items, competencies, rating scales and relationship groups). The remainder of the user interface text, including review instructions and EchoSpan standard interface language, will be translated automatically in the Professional Edition of the tool. If you forget to apply a custom translation for a particular element, the content will, by default, be displayed in English. Support of the EchoSpan tool is provided in English only.